Open from 1st April until 30th September in the valley of the Céou. Le Douzou promises a break from the daily grind, with a holiday of guarenteed fun and nature! 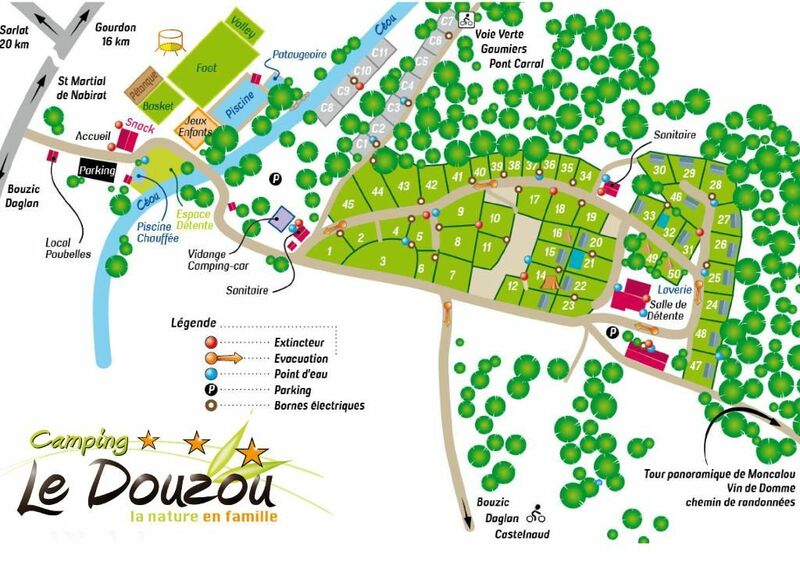 Le Douzou is a camp site situated in the countryside, between the village of Bouzic and St Martial de Nabirat in Dordogne Périgord Noir. It is crossed by the river Céou and offers large pitches limited naturally by well established and natural vegetation. Situated near numerous riches of the Perigord such as LASCAUX (the most well known paleolithic site in the world), SARLAT (mediaeval city), LES EYZIES (world capital of prehistory), the VEZERE valley (valley of Man) and the fabulous caves of TOURTOIRAC. 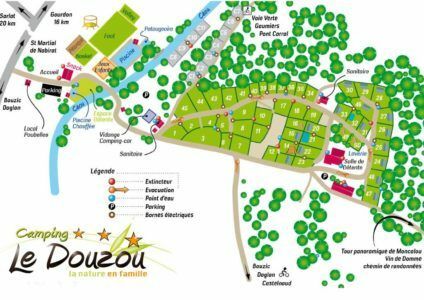 The site is 10 mins from the traditional riverside towns of Domme and La Roque Gageac on the Dordogne river, and the many options to explore in kayaks/canoes. You can rent Mobile Homes (from 2-8 people) as well as just empty pitches. For the active holidaymaker many roads and tracks are open to you for walking and jogging. on the site you will find a football pitch, basketball, pétanque and volleyball. In summer there is entertainment in the campsite. There is a large pool with paddling area. The children have their own play area with a shallow heated pool. All of this is situated on either side of the Céou where you can of course have a quick dip to refresh yourself. If you don’t wish to cook, snacks are available. You will also find that if ordered in advance, fresh bread, baked in wood-fired ovens, is available every morning from the local baker.